After hours of testing, writing, reviewing and discussing metal bats with vendors and manufacturers alike, we have settled on the 2018 Demarini Voodoo Balanced as the best aluminum baseball bat. Our testers preferred the ultra smooth smash of the two piece hybrid design. Most hitters liked the lighter, ‘balanced’ version of the bat instead of the more end loaded ‘Insane’ version. Those wanting a bit more stiffness in their swing liked the Marucci CAT 7 and our fastpitch players preferred the Anderson Rocketech. 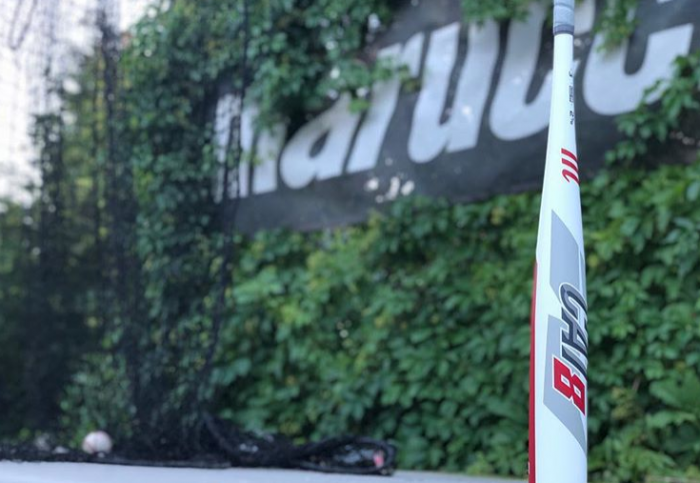 The large size offerings within the model was a plus, and the brand value ran high with a lot of users, who have used DeMarini Voodoo bats since 2014. If you’d rather have a single piece aluminum bat, we suggest the Marucci CAT 7. This 2018 Voodoo comes in a BBCOR, Big Barrel and USABat option. The USSSA Big barrels come in a few different drops. Although the barrel is not massive compared to some composites, the bat is a perfect blend of hot out of the wrapper aluminum with the smooth smash of a composite handle. Two other legitimate options in the aluminum metal barrel space, if your focus is high school BBCOR bats, are the 2018 Louisville Slugger 618 Solo and the Easton Beast X Speed. Both bats use an ultra light aluminum alloy to deliver a decent sized barrel. We also love how both these bats come in a short 29 inch version. These bats will feel stiffer than the aluminum winning Voodoo. They are, after all, single piece aluminum bats. But you can expect more durability from these two, as well as a more reasonable price point. If you are looking for an aluminum bat in the USSSA or big barrel space, then might we suggest the 2018 Marucci Hex Alloy. This single piece aluminum bat boasts the largest barrel in its class of single piece metal bats. And although for younger players, we like the idea of a two piece hybrid as to encourage aggressive swings, making the Hex alloy a legitimate runner up in the big barrel aluminum metal bat space. This is an easy one. The Rocketech is the best aluminum barrel fastpitch bat on the market today. We also love it for cold weather and for any who love a strong swing with the ability to go deep at any plate appearance. This bat does swing heavier than what many may be accustomed too—but if you can wield this beast and want an extremely durable fastpitch bat, then we highly recommend the Anderson Rocketech as the best metal fastpitch bat. Although bats like the VELO look tempting, we really like the barrel size and multiple size options of the 2018 Easton Beast X in the USABat space. For a single piece aluminum metal construction, the barrel size is quite large. Granted, the real winner in this category is the Voodoo Balanced, but that bat has already taken the top spot. This 2018 Easton Beast X is a legitimate option, too. In short, there is no difference between bats referred to as aluminum or metal. In today’s market, every metal bat on the market is made of aluminum. This aluminum is manipulated to perform better by additional chemicals. The addition of these elements within the aluminum, like scandium, is why many officially call aluminum bats aluminum alloy bats. But, at its core, aluminum bats are simply metal bats just like composite bats are simply plastic bats. There are a number of general benefits to aluminum metal bats when compared to composite and wood bats. We discuss that here. Also, you might find it helpful how some vendors make their bats sortable by aluminum metal only. We have tested every performance bat since the genesis of this blog in late 2014. Those tests involve both simple approaches and more complicated ones. Measuring the swing weight, comparing it to previous models and seeing where the bat fits in the grander scheme of things, and discussing the aesthetics of the bat constitute more of our superficial approaches. We also use the bat in games and practices, as well as have multiple player feedback on each bat. More recently, we have driven ball exit speeds and barrel size testings on our bats too. This more quantifiable data gives added insight to which bats really do perform best. Add that information to conversations with real players, an obsession for reading real reviews on a bat’s performance and dialog with major vendors and manufacturers, and we start to formulate data on what the best aluminum metal bats actually are. We discuss many of the advantages of aluminum bats when we compare them to composite and wood bats. (See here). In short, aluminum metal bats provide the distinct advantage of a hot out of the wrapper performance—meaning, no work in period like composite requires. That hot out of the wrapper performance provides confidence from swing one that you are getting the most out of your bat.